By hungry runner on June 27th, 2012 . Filed under: Blogs, Cupcake Ideas, Decorating . Bakers Royal always has the most creative ideas! We’ve already shared with you the peppermint mocha cupcakes, the creme brulee cupcakes, and the fun cupcake pudding shooters! Naomi has come up with another great cupcake recipe that I couldn’t resist sharing; beer and pretzel cupcakes! These cupcakes are a great combination since they are salty and sweet which is very popular. I love the shared look of the pretzels and agree with Bakers Royale, it looks very dramatic! I know that girls like beer but for some reason these seem like a great cupcake idea for a guys birthday. 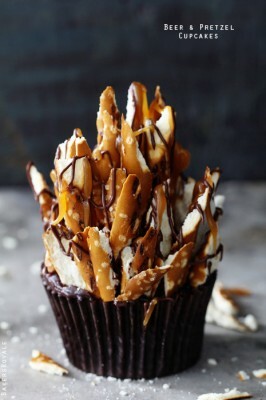 There are also notes to turn the cupcake into a chocolate caramel pretzel cupcake if you are not a beer drinker. Magnificent website. Plenty of useful information here. I’m sending it to several friends ans additionally sharing in delicious. And naturally, thanks in your sweat!